It has been another steady year for buying and selling residential real estate. The primary trends of inventory decline and price increase continued, and more of the same is anticipated in 2018 if consumer, employer and builder confidence remain high. Tweaks in tax law and mortgage rates could create either unwanted or desirable effects, depending on the market. Trend lines may flatten or turn, but it’s too soon to say exactly what will happen. Get The Skinny – November 2017! 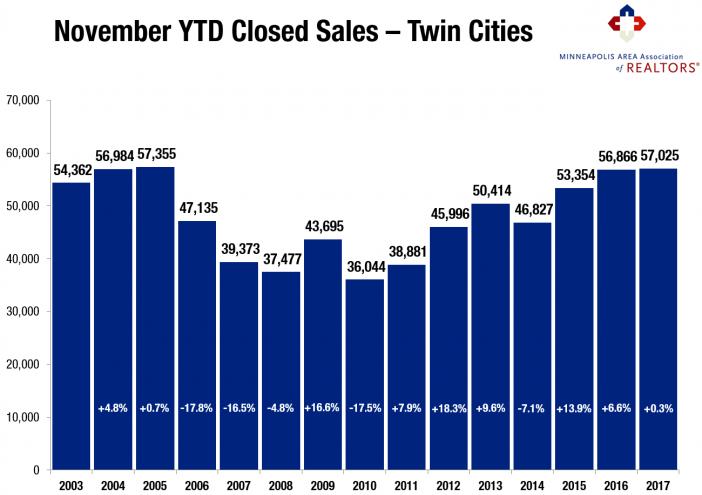 With the majority of 2017 in the books, the Twin Cities housing market is likely to cap off another mostly positive year. Sales and prices both increased while interest rates remained attractive. More homes sold in less time and for closer to asking price. The economy remained supportive to housing by way of low unemployment and moderate job and wage growth. The biggest challenge facing the market hasn’t changed over the last several years; a persistent lack of inventory continues to frustrate buyers. The table highlights November monthly activity as well as 2017 YTD activity with year-over-year change. New listings are down 2.1 percent for the year so far and closed sales are up 0.3 percent. Prices are likely to end the year around $245,500, up about 6.5 percent compared to 2016. At a brisk 56 days, market times are down 13.8 percent for the year, indicating sellers are accepting offers more quickly. And lastly, the number of active listings on the market is down 24.1 percent to just over 9,000 homes for sale. With months supply at just 1.8 months, absorption rates are at their lowest level in at least 15 years and indicates a sellers’ market. Generally, five to six months of supply is considered a balanced market where neither buyers nor sellers have an edge. Given near-record demand and suppressed supply, prices scurried higher. The end of 2017 will mark the sixth consecutive year of rising home prices. 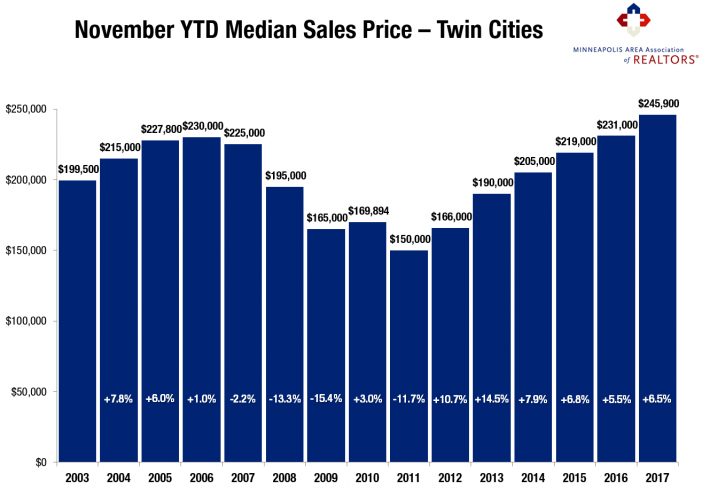 Home prices are above their prior peak from 2006, as are median household incomes in the metro area. The economy and political environment also affect housing. The national unemployment rate is 4.1 percent, though it’s 2.3 percent locally—the lowest unemployment rate of any major metro area. A diverse economy supports housing, as job and wage growth are key to new household formations. The Minneapolis–St. Paul region has a resilient economy with a global reach, a talented workforce, top-notch schools, exposure to the growing technology and healthcare fields and a quality of life that’s enabled one of the highest homeownership rates in the country. The average 30-year fixed mortgage rate declined from 4.3 percent to 3.9 percent recently, still well below its long-term average of around 8.0 percent. A third rate hike was announced this month. Additional inventory is still needed in order to offset declining affordability brought on by higher prices and interest rates. From week to week, the tallies may vary slightly from the week prior in year-over-year comparisons, whether with a strong positive surge or a lingering negative streak. Tracking weekly figures is important for active real estate professionals, but the cooldown period of a meaningful real estate trend often takes weeks, if not months, to draw determined conclusions.